This is a story about a farm, about two people brought together by common passions for community and farming, and about the friendships and community created along the way. It’s a story about the structural challenges facing urban farms and how one farmer is meeting them. It started, appropriately, at the Twin Oaks Communities Conference, where we met in 2003. We laugh that we—both Seattle residents—had to travel clear across the country to meet the person who would become our best friend. In 2010 Kirsten Leetham refocused her career on the local food system. She selected possible farms to apprentice at and asked me to write introduction/application letters. That was our first co-writing experience and we’ve found it suits us well. When I saw the theme for this issue I asked Kirsten if I could tell her story. She was excited to share this amazing unfolding experience. Though written by me, this is Kirsten’s story, her voice as much as possible, her point of view. When I (Kirsten) started my apprenticeship I wasn’t sure exactly what my farm would look like, but I knew that I wanted to be right in the middle of the city rather than out in the country. I didn’t want the environmental benefits of sustainable farming saddled with a burden of fossil fuels. For me the choice is obvious between an organic apple from New Zealand and a conventional apple from Washington. We can’t keep moving food and other goods around the world, chasing low wages (and exploitation) and burning oil as if it is infinite. The biggest hurdle for young farmers with few assets is usually land. I decided on a “distributed model,” where a farm is made up of multiple small spaces: back yards, vacant lots, park land, planting strips. There is so much under-used land in cities! Turning this land into gardens improves soil and reduces runoff pollution. I originally wanted to use city-owned property, thinking a lease would be more clear-cut than providing a CSA share. I learned that the city didn’t allow anything grown on public land to be sold, including produce from community gardens and private gardens in planting strips. Some of those regulations have since been relaxed. Ironically, as I was installing my first garden, representatives of the city, county, and public were discussing ways to encourage urban food production. With the route of using city-owned property closed, I focused on under-used yards. I thought I would easily find land within a short bike ride of my home in West Seattle, but people are surprisingly closed to anything new. The yards needed to be just right: full sun, a slight slope for drainage, enough space, an enthusiastic homeowner. They had to be fairly close together since I wanted to do this entirely by bicycle. (I had met a landscaping company, Garden Cycles, that worked from bikes, so I was confident it could be done.) Other factors I considered: books assume that my garden is right outside my door where I can open and close vents on greenhouses twice a day, turn water on and off, etc.—but this is not as easy in someone else’s yard. I didn’t know if there would be space to store my tools. I had to decide if I would invest in multiple copies of large tools or haul them around on my bike trailer. I wanted a fence to keep out dogs. Aggressive neighboring dogs can scare volunteers and children. Since part of my mission is public education and community involvement, I need a place where people can stop by, shop for veggies, bring their kids. Aesthetics and perception are considerations, especially if I add animals. Compost piles don’t smell bad, but there is a common expectation that they do. Chickens and goats do smell, and having animals is a much different consideration than a garden. I’d like bees eventually but many people are afraid of them. I’m often told that farm animals will “cause trouble,” but well-cared-for animals bring neighbors together more than they cause conflict. Passers-by, especially kids, love to visit animals over the fence. People aren’t used to seeing tools, bare earth, and piles of wood chips. These issues can be overcome with education and conversation. A working farm isn’t “tidy” like a showy front-yard flower garden, but that doesn’t mean it’s not beautiful. There is beauty in usefulness. I often discuss the beauty of local sustainability, the dream of someday seeing my city covered in food. I was fortunate in finding my first farm plot. Suzette has been a huge champion of what I’m doing. I have the entire fenced back yard for garden, and garage space for storing tools. She appreciates the vegetables I grow for her, isn’t super concerned with tidiness since it’s a back yard, waters occasionally in hot weather, and has cooked food for volunteers at work parties. I have access to a bathroom with a utility sink, which she doesn’t mind volunteers using. I have turned down yards that were otherwise well suited because the owner didn’t seem as supportive. When I started I thought the space would be more important than the relationship with the homeowners. I have found the reverse to be true. If someone “tries it out” for a year and decides this isn’t for them I lose a HUGE investment of time and money. Now I get to know the people at least as much as I know their yard. From Suzette and other homeowners I’ve learned how strongly people here care about local sustainability. Early on I was told that I needed to “sell” the idea of using someone’s yard, that I would be welcome primarily for what I could give them. Now I have more yards offered than I could possibly develop at once, even before saying that the host gets a CSA share. Other people see the wasted space and opportunities but don’t feel like they can do anything about it. When I say they can help simply by letting me be there, people get very excited. Having found my land, I encountered my second hurdle. The soil in West Seattle is contaminated by cadmium and lead from the smoke of a long-gone smelter. I lost an entire growing season learning to solve this problem. There are no regulations or even published guidelines on how many ppm can be in the soil for it still to be safe to eat the veggies grown there. There is little information on bioremediation except mention of some non-food species of mustard that I can’t find seeds for. (I imagine they’re not a popular crop if they selectively uptake heavy metals!) The solution I found after much research and experimentation is to buffer the soil with organic matter, which binds to the metals and reduces uptake. I turned in heaps of compost, planted various crops, and had them lab-tested. They came in way below 2ppm, the threshold for drinking water. “Urban Farming” is en vogue, with several magazines, dozens of books, and classes in every large city. I dislike this terminology. The distinction I see between a farm and a garden is selling farm products. There is a blossoming of “urban gardening,” which is wonderful and essential. Cities that promote “urban farming” often don’t support small commercial farms. I see this as elitism: not everyone can or wants to grow their own. These muddied terms and policies hamper sustainability by continuing the dependence on long-distance food. Seattle is better than many cities at prioritizing urban food production. Most of that still focuses on people growing their own. 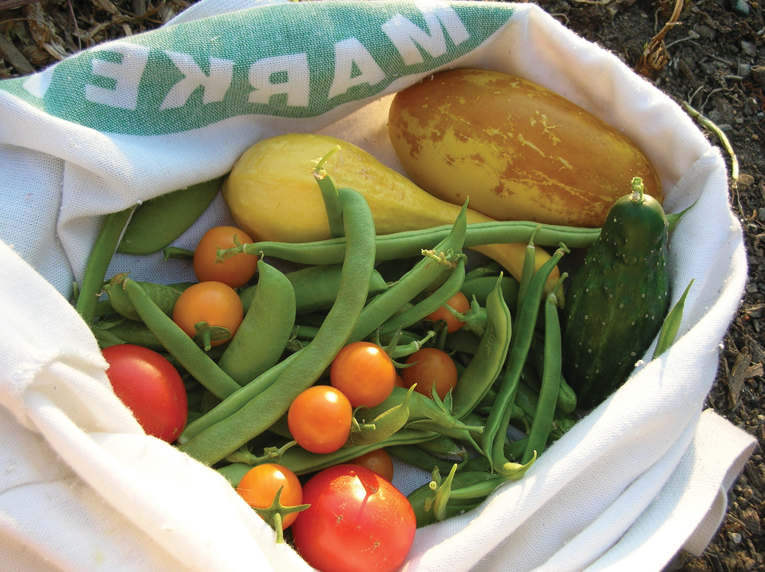 In 2010, then-mayor Mike McGinn announced a “year of urban farming” to focus on those issues. I’m so idealistic that I see less real effects than I’d like. It’s hard to be patient. I think a fundamental understanding of the urgency and the major systemic changes that are needed is still lacking. There is an effort to coordinate programs and goals between governments, universities, and nonprofits. One of those is the Regional Food Policy Council (RFPC). I’ve been to several meetings and I’m looking forward to joining the RFPC to represent small start-up farmers. They aren’t addressing some of the issues that I think are important, their vision isn’t big enough, but they’re an important ally with resources the movement needs. The board is mostly government people who spend a lot of time on bureaucratic stuff, talking about meetings, liaising, reports, and who chairs what. I know that all that is important, especially working with other groups to coordinate efforts, but I want to know how it works on the ground, how new farms are created. I really had to dig to find local food and sustainability programs, and they constantly change. It’s hard to find programs that you don’t know exist! I’ve found resources too late, after deadlines, after I found another way. Networking has been more effective than research. Often people I meet point me to groups or programs I wasn’t aware of. I learned about the Seattle Farm Pilot Project (SFPP) from someone I met at a Northwest Intentional Communities Association (NICA) gathering. Seattle purchased two farms to preserve open land and have space for classes. The SFPP made three sections of these farms available to small farmers on affordable leases. The 1/10th-acre spaces are tiny as farms go, but twice as big as my current space. The application was long and convoluted, with many requirements that didn’t make sense from a farming point of view (having been written by bureaucrats). I consider it a win even though I wasn’t selected. Applying put my name on their radar in case of future additional openings and showed the city that farmers want to engage with them. I’m glad that there were many applicants, demonstrating high interest. Demand is rapidly rising for healthy local foods but I’ve noticed an expectation barrier, a disconnect between what consumers want and how they think it will look. Promoting local foods is an uphill battle against the convenience of grocery stores, worldwide shipping, and disposable packaging. Americans are used to one-stop shopping, buying tomatoes and berries all year, produce that is perfectly clean and uniform. Farmers’ markets carry out-of-season produce from elsewhere, bought to supplement local in-season crops. This skews peoples’ perceptions. My homeowner even wants lemons and limes, which don’t grow in Seattle! My first two years I did only on-site sales, no CSA or farmers’ market. People came, bought veggies…and came back once if at all. Farm stands rely on repeat customers spreading the word. When people don’t come back I get no feedback, no idea what did and didn’t work for them: Selection too limited? Open the wrong hours? Not happy with the quality? Or did they like everything, intend to come back, then forget because it wasn’t part of their regular habits? My dedication to principles may have set my business back by those two years. Instead of using disposable packaging I sold handmade cotton bags or asked customers to bring containers. Since I’m a farmer with a bike instead of a truck, delivery to restaurants, customers, or farmers’ markets was impractical. I wanted to sell only to my immediate neighborhood, bringing “local” to walking distance and using no fossil fuels at all. This season we’re offering CSA shares, including local delivery. (This only works for me because Sylvan will be here with her car once a week anyways.) I have conceded that some plastic bags are needed for now. I will encourage reusables while acknowledging the difficulties: I still store some veggies in plastic in the fridge because they wilt in fabric and hard containers take up space. I will be purchasing out-of-season fruits for CSA boxes as a convenience for customers and to support other organic farms. Operating a farm alone also raised barriers. I had regular hours but couldn’t be there every day. I can’t run a farm stand in the front yard and work in the back yard at the same time. Signs directed people to the back entrance, but a sign isn’t as enticing as an overflowing garden and a farmer digging in the dirt. There’s a tourism aspect that I can’t capture here. My next site will be a front yard so I can be seen by passers-by. Veggies were “picked to order” to avoid waste and ensure freshness. I harvested only a few things in advance to display as teasers. Farmstands mounded high with food look great, but much of that won’t sell. This is another area where I wonder if my ideals deterred people from coming back. Those extra five minutes seem worth it to me, both for freshness and to connect farmer to eater, but people are often busy. Many people shop on their way home in the evening. In Summer plants have wilted a bit by then, and in Spring and Autumn it’s dark early. For reasons I don’t understand, people seem more interested in a farmstand in Summer, turning to grocery stores and farmers’ markets as soon as the weather starts to cool. Growth and expansion will hopefully reduce these issues. A reputation for fantastic food, a front yard farmstand, and a CSA program will increase volume, convenience, and visibility. I’m adding another location this year, bringing exposure to a new set of neighbors. I’ve already chosen the neighborhood and am getting enthusiastic responses from the neighborhood association. Sylvan is now handling marketing and outreach. She has done fundraising and marketing before, both for business and nonprofit. One of the wonderful things about gardening where people can see you is that they stop to watch and talk. People ask about things I do, how to grow particular plants, or compliment something they enjoy. I usually invite people in to taste, touch, smell: gardening is such a multi-sensory experience. Early in my second year a neighbor admired my raised beds held in place by branches. He invited me to come see his newly installed, first-ever garden. I walked over to see his handiwork, gave some advice on thinning…then we talked for two hours about sustainable living, urban agriculture, and other common interests. Over the Summer Steve and I shared resources and tools, helped in each other’s gardens, did two-person projects together. We split a delivery of compost, eliminating the extra truck trip. Working together and walking around the neighborhood, we noticed many chicken coops. I wanted chickens but had nowhere to keep them; he wanted eggs and to learn a new skill. It was a perfect win-win arrangement since I mostly wanted them for turning vegetable waste into fertilizer and tilling fallow beds. We built a chicken coop together in his yard and shared the joy of raising chicks, teaching them to eat worms and forage. He frequently called me for advice but did all the day-to-day chores. When a chicken was injured by a dog, we nursed it back to health together. Another farm-inspired partnership has been with Sylvan, my coauthor. We were both busy with gardens, work, and family and had little time to spend together. She suggested that we work together once a week, alternating between her garden and mine. We get more done together and have help for some of the two-person projects. (Ever try to put up a seven-foot-high trellis alone?) This has led to other networking opportunities, shared resources, carpooling to events, and sharing of tools. Sylvan brought un-sold produce to the food bank with her car. Our conversations in the garden while working together led to this article. I talk to everyone I know or meet about farming and sustainability, so when I have a work party everyone gets invited. Alice was a Fitness Training client of mine with three little kids. We had some concerns about kids at work parties but agreed that it was important to let kids get dirty and learn where food comes from. We discussed safety hazards, including sharp tools and exposure to dust that might contain heavy metals, and provided safety precautions. One sunny June day we had a work party full of children! Their “help” was a mixed blessing, inspiring indulgent smiles and building as many messes as garden beds. The older kids there moved a lot of dirt. We are organizing a public “Kids in the Garden” event this Summer, with a bit more planning and lots of soapy water. There was a memorable work party near the beginning when we moved a tall pile of “fill dirt” (mostly rocks) that the homeowner had gotten for free. We built raised beds, filled them with fill dirt, and topped them with compost and better soil. The homeowner cooked for everyone, opened her house and played hostess, even let the older kids play inside when they got tired of helping. Someone I had met briefly at a volunteer ecological restoration event came and worked hard in the sun for hours, not out of personal friendship but just because this matters. Supportive gestures like his inspire me! My biggest challenge with work parties is organization and delegation. I have to plan multiple tasks in advance and have everything ready. The best way to explain something is to show it, rather than tell it, but I can’t be everywhere at once. With volunteers I want to balance their desires to work, socialize, learn, and feel useful. Sometimes I think getting ready for a work party is more effort than just doing it all myself. Despite the challenges, I continue to have work parties as an important part of teaching as many people as possible about food and soil. Events like the aforementioned ecological restoration serve a dual purpose: first to promote my farm and learn about resources that can help me, and also to contribute to my community. I’ve been involved with Community Orchard of West Seattle and Sustainable West Seattle, worked with Garden Cycles, gone to NICA meetings, tabled at neighborhood events for the Seattle Farm Co-Op, gone to lectures and classes by the Seattle Tree Fruit Society. I regularly volunteer with Seattle Tilth. I attend the “Meaningful Movies” nights and was asked to be on a discussion panel when they showed urban farming short films. I’ve volunteered with City Grown Seattle, which has a similar model to mine, and Alleycat Acres, a nonprofit urban farm that helped shape my own vision. I meet all these people at other events, like connecting links in a web, one leading to another, since Seattle lacks a central coalition for the urban farming and sustainability movements. When I meet other urban farmers at these events we share stories of success and frustrations, point out resources, encourage each other. Two other urban farms have gone under since I started, which puts a damper on new businesses. Even with increasing demand for healthy food, this is still more of a “calling” than a lucrative career. As of February I have a new garden partner. Dale was referred to me by someone from the West Seattle Women in Business group, who had an acquaintance who sounded like a perfect match for Urban Flex Farms. Dale is a gardener and aspiring farmer who was looking for an opportunity to get involved. He is also bike-only, also a Fitness Trainer who advocates “real work” and outdoor exercise for building health and strength. He loves keeping records and statistics and is excited about increasing efficiency. 2015 is bringing big changes to Urban Flex Farms. With a second farmer, a promoter, and another farm-site being developed in time for Summer planting, we finally have enough size to impact the West Seattle local food scene. We launched our CSA program this year. Sylvan is planning two public events (including “Kids in the Garden”), local news exposure, and creative recipes for the Urban Flex Farms blog. I took a class from Curtis Stone of Green City Acres. I’m going to run our second site with his methods so I can compare them side-by-side. When I’m not digging in the dirt I’ll be working with the Cascade Harvest Coalition and the RFPC. Between them these groups could be Seattle’s much-needed umbrella for food sustainability issues. I am passionate about doing activism and farming as two parts of a whole. I don’t want future farmers to struggle the way I did to find information and programs. The easier it is to start urban farms the more we’ll have. I know that other people like me are out there, people who want to farm, not just garden, people who want to make this be a real career, people who care passionately about both what we put in our mouths and the effects of how it’s grown. I look forward to hearing their stories. Kirsten Leetham and Sylvan Bonin live in Seattle, Washington, which is blessed with a climate that allows year-round gardening. Kirsten runs Urban Flex Farms and Sylvan is a Personal Assistant and Organizer. Sylvan, the realist, grew up on a commune, and Kirsten, the dreamer, grew up in a city. They have been balancing each other’s talents and experiences for nearly a decade. Both have made sustainability, food security, and community the central focus of their lives.